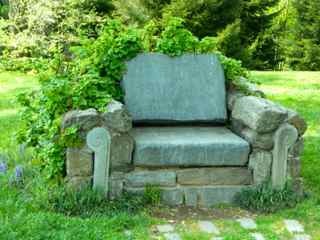 In my gardens I don't have an alluring stone chair like the one seen here at Chanticleer, but I've added enticing and somewhat more practical seating in specific areas. 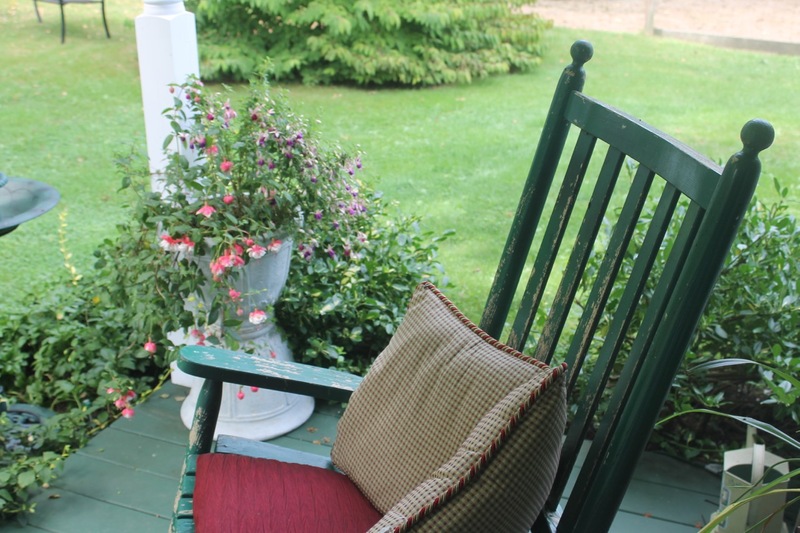 Every morning I'm drawn to the bench by the pond, grabbing some pillows from the chairs on the deck to make it more comfortable. There's something about the sound of a waterfall that soothes and sets the tone for a calm day. With my latest bout of gastritis, I forego coffee and sip a cup of camomile tea adding to the tranquility. Springtime by the pond when the roses and peonies bloom. Early morning birdsong, sounds of water, and the breeze in the zebra grass. 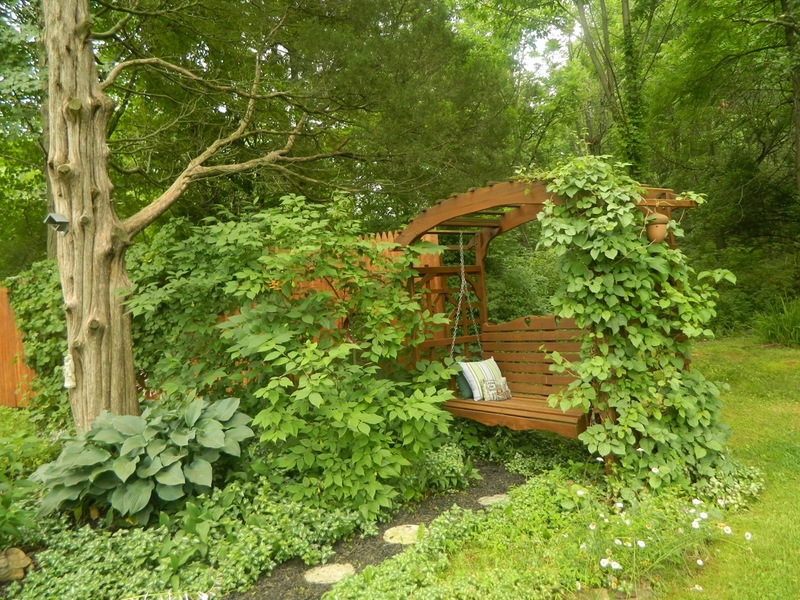 The swing in Serenity, the shade garden, provides another peaceful spot. 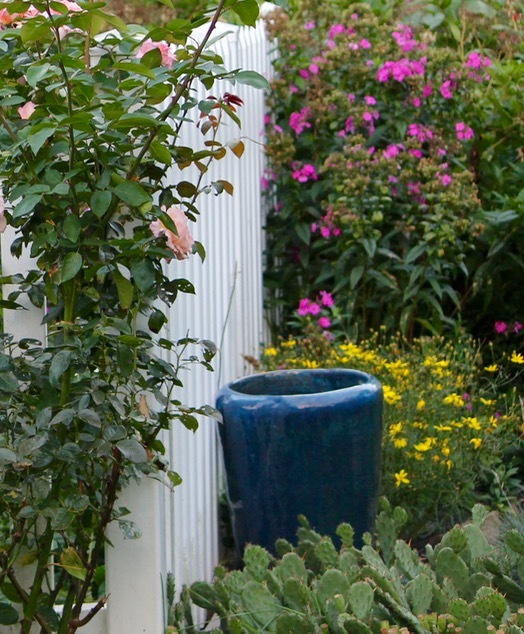 The calycanthus at its corner adds to the feeling of privacy. A great place to read a book or sit with a friend and chat. Many years ago, pre cottage garden, we attended Rutgers Day in New Brunswick when my daughter was in college there. In addition to the festivities there were all sorts of vendors. We found some handmade Adirondack chairs, a small table and footrests. I don't remember how we got them home -- I think we paid the vendor to deliver them. For some time they've resided in the Woodland Walk. 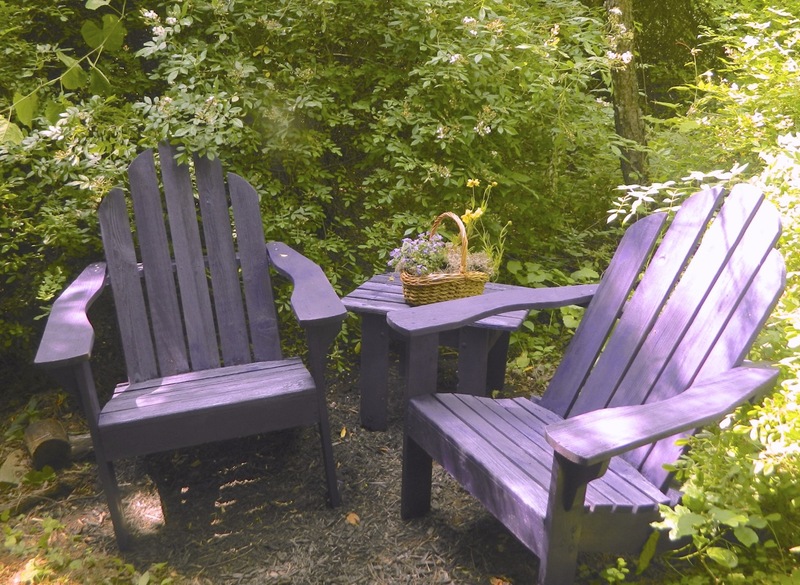 From bare wood, to green and lately painted purple by H.H. 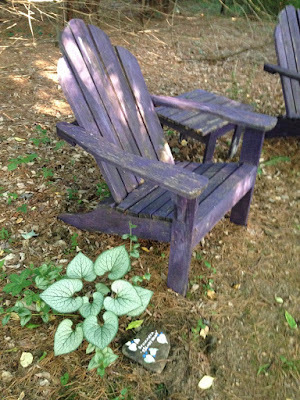 (I don't know why purple) they are looking decidedly worn, the footrests long gone. But we enjoy them still. The Woodland Walk is the place to sit on a very hot day, where the temperature is ten degrees lower than in the cottage garden. The Adirondacks when H.H. first painted them purple. I kinda like the distressed look of the paint now. 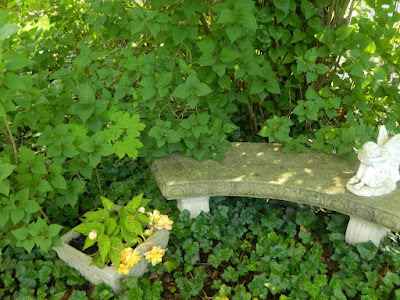 The Stone Garden has a stone bench under the lilacs. 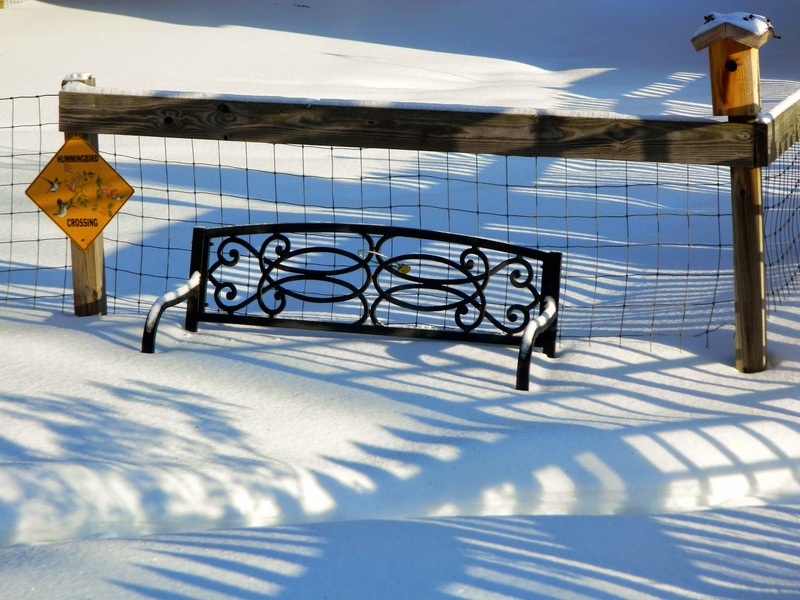 The resting fairy at the end of the bench is happy to share the space. The patio has traditional patio seating for eating outdoors. 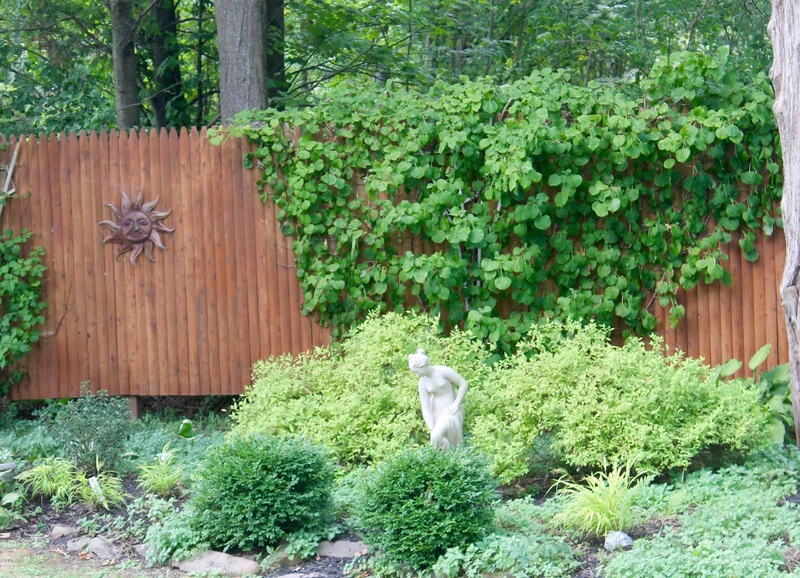 Fencing and tall plants provide privacy. The rocking chair in my potting shed is a favorite spot. This antique chair was handed down to H.H. by his mother who received it from a cousin (who was also her teacher.) 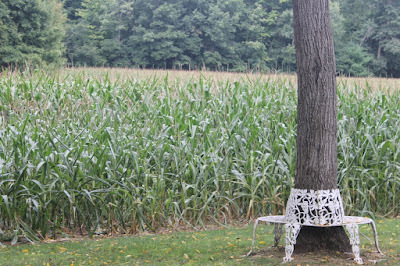 Purdy was the name of the original owner, so the family calls it Purdy's chair. 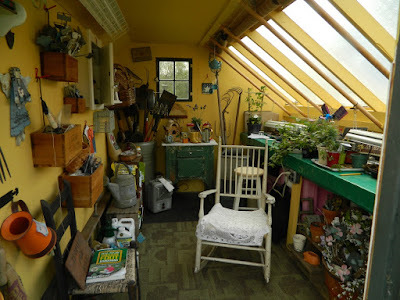 Purdy's chair in the potting shed. A 90-year-old visitor (not as old as the chair) rests for a moment. 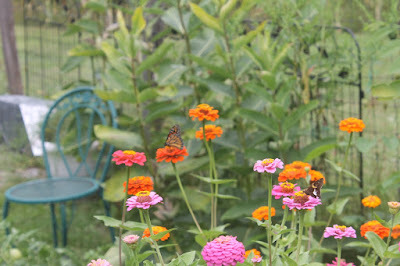 Outside the potting shed in the kitchen garden, a retro metal chair puts you among zinnias, milkweed and butterflies. While originally English cottage garden style was considered 'rustic,' I can't resist adding some elegance with the occasional Greek statue and Victorian style seating. The table and chairs in Serenity Garden provide a perfect setting for a cup of tea. H.H. always wanted seating around a tree trunk. 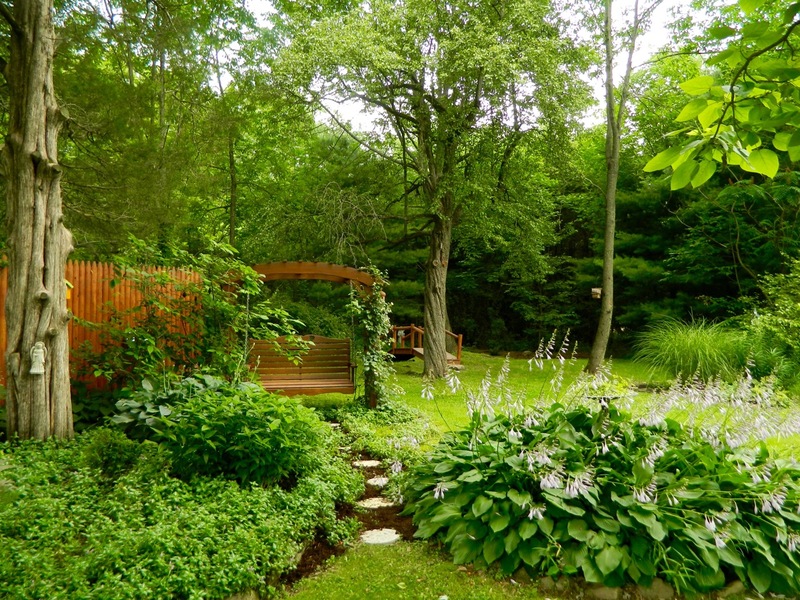 This one in the Walnut Dell provides views of our corn fields and woods beyond. 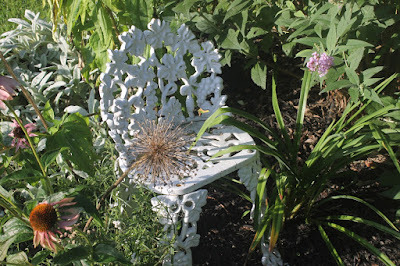 Some seating in my garden is just whimsy. 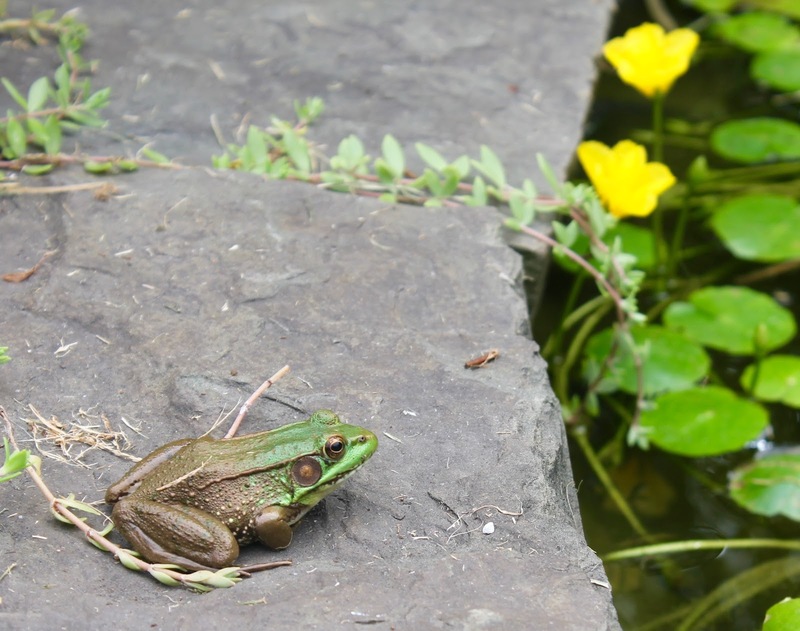 I know that gardeners are usually so busy working they have no time to rest. Determined to enjoy my efforts more, I begin each day sitting in my garden as I meditate, then plan the days activities. I didn't sit outside for long this morning, however, with the dramatic fall in temperature since Autumn arrived. I spent just a few minutes in the rocking chair on the back porch. Do you have inviting places to sit in your garden? 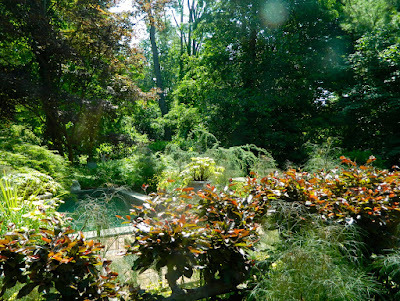 My mid-September gardens look best when viewed from a distance where you can't see the plants' decline. The flowers that are still bravely blooming in spite of the unprecedented heat and lack of rain of the last several weeks, definitely show deterioration. While the lawns need mowing less often, they are littered with leaves that fall before changing color, adding to the general sense of untidiness. The 'sadness' of autumn has arrived early before the trees have donned their fabulous, dramatic colors. 'Sad' because I hate to see summer go. 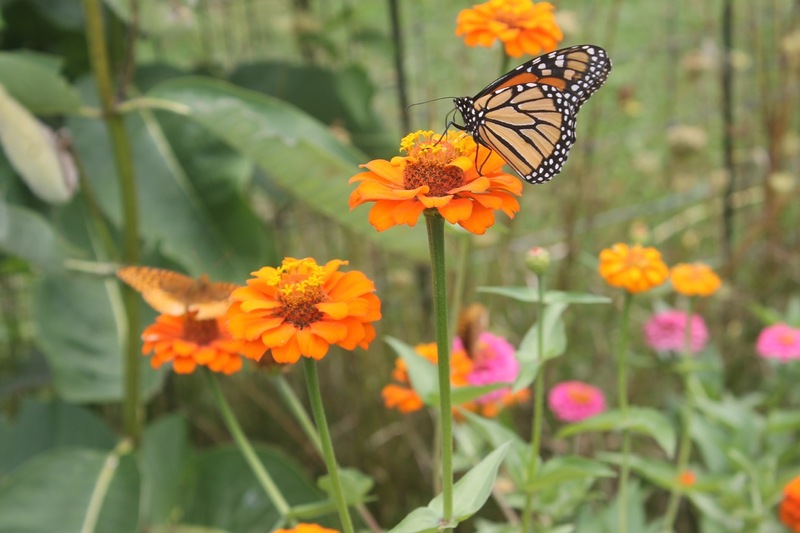 One end-of-August-early-September joy, however, was the unexpected arrival of monarchs. While I delight in numerous butterflies, especially fritillaries, in my summer garden, the monarchs unfortunately were absent until recently. 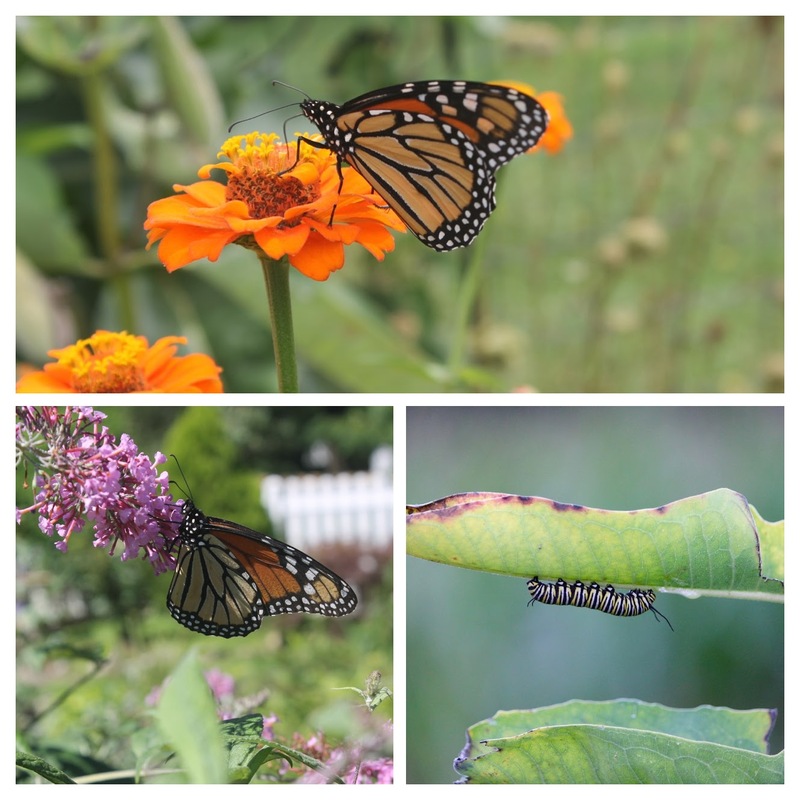 I examined the milkweed daily for eggs and caterpillars and was finally rewarded. Let's take a look -- bearing in mind that while all these plants bloom today, not all photos were taken this week (as I've not been well.) 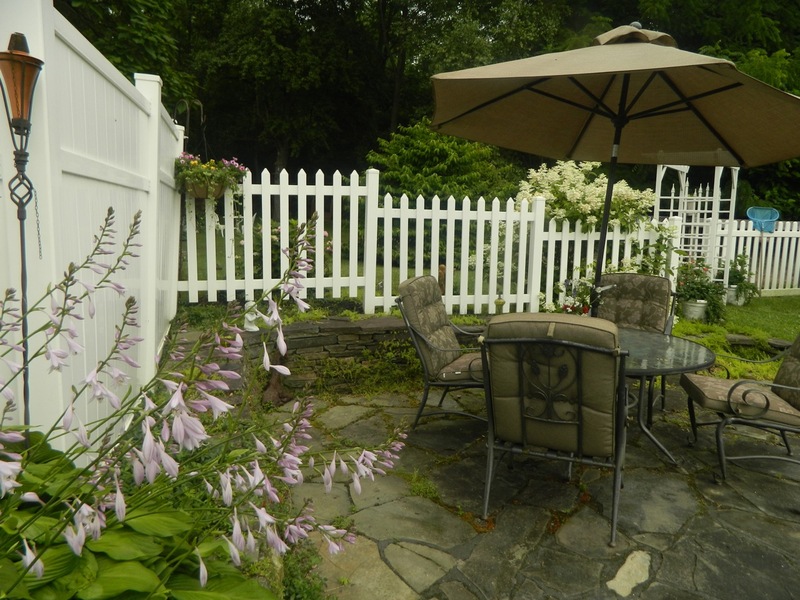 The garden, therefore, is less vibrant than it appears in this posting. 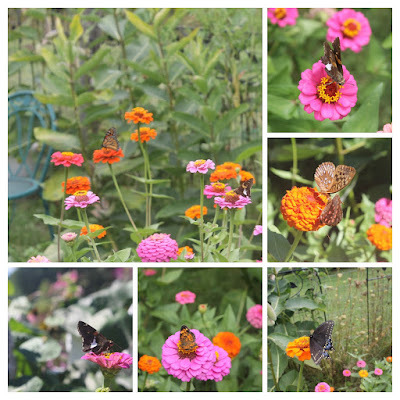 Still have lots of zinnias. They are butterfly magnets. 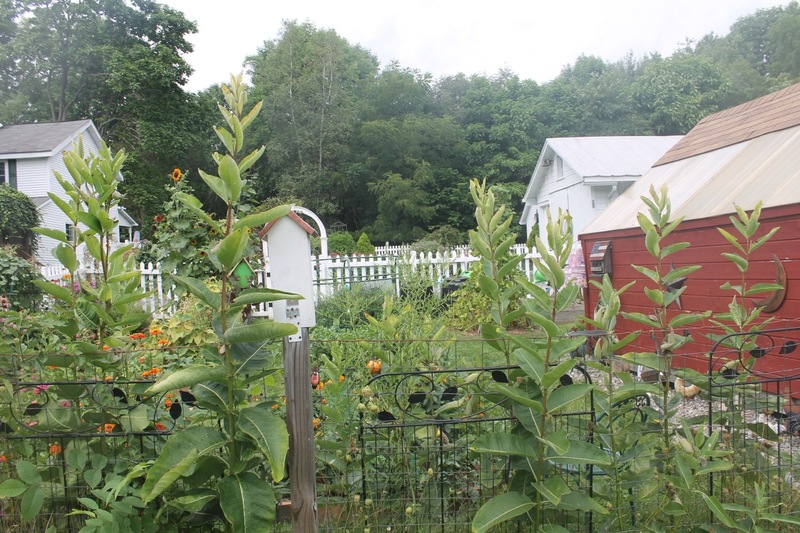 Milkweed at the bottom of the kitchen garden. 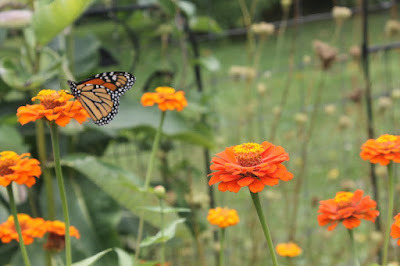 Monarchs at last ... and caterpillars on the milkweed. 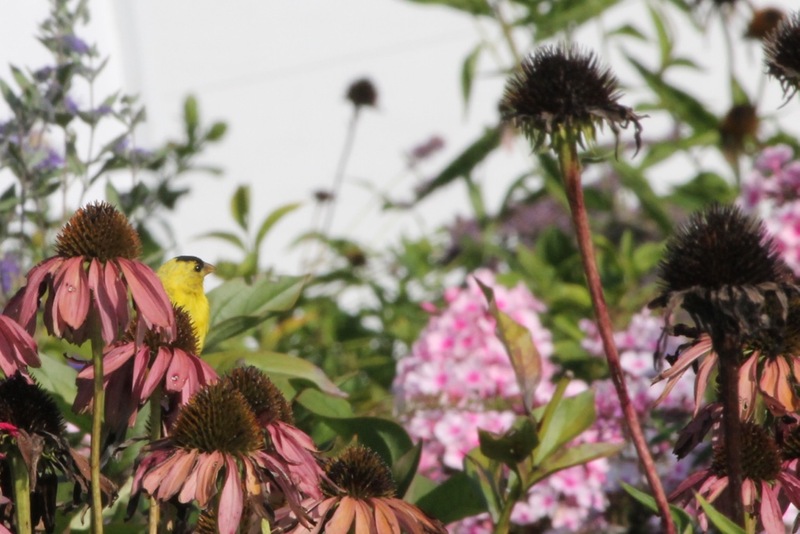 The goldfinches twitter through the stands of purple coneflower enjoying the seeds. I will not cut these perennials back but leave them through the winter for the goldfinches to enjoy. This goldfinch is enjoying the sunflower seeds. I have just a few fall-blooming flowers. 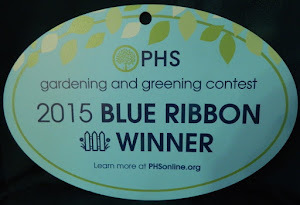 My favorite has to be 'Blue Mist Shrub.' It is a favorite of the bees too. I am happy to report the roses are not giving up. I'm loving their final bloom of the season, especially with no Japanese beetles around. Beyond 'Peace'- threadleaf coreopsis and pink phlox. 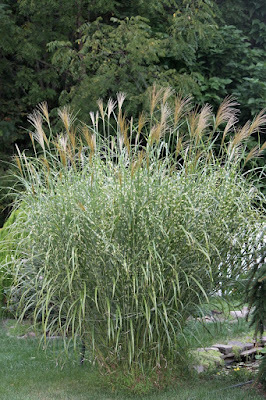 The zebra grass by the pond is probably eight or nine feet tall to the top of its pretty plumes. 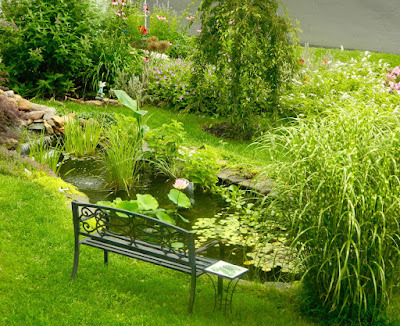 It works hard shielding the water from the scorching summer sun thus hampering the growth of algae. We've experienced a lot of winds lately, and I love the way this tall ornamental grass sways in the breeze. 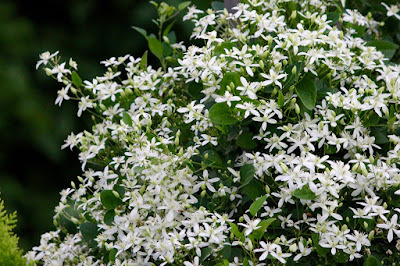 Another late blooming plant is the sweet autumn clematis. This vine you either love or hate. It is despised for its invasive habit, but I have not experienced a problem, maybe because I cut it down almost to the ground when it finishes blooming. 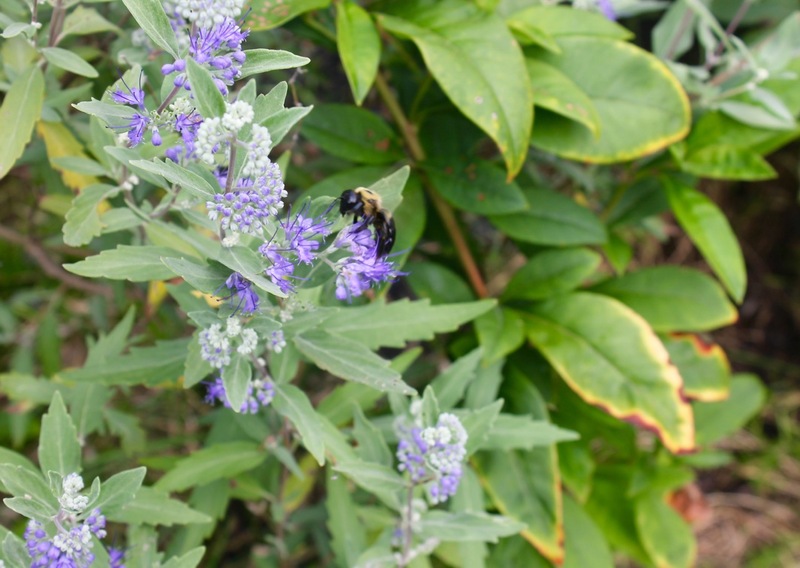 The gardener who gave it to me told me it was the native variety and less aggressive. 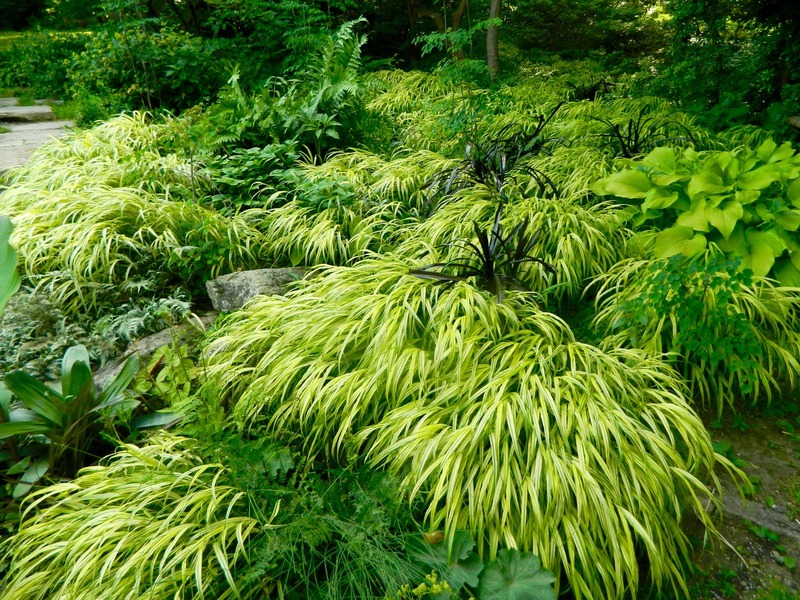 I have since learned from the shape of the leaves that it is not native. 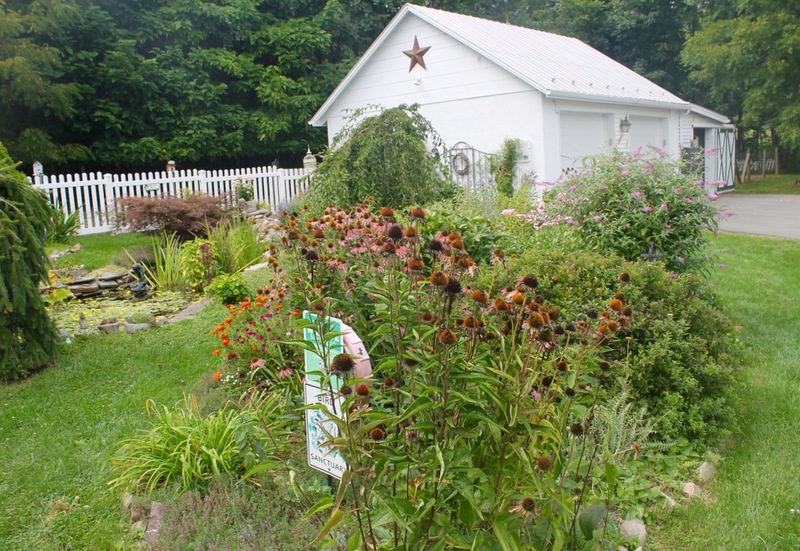 However, it has not sown itself around and it makes a dramatic impact in my fall garden. 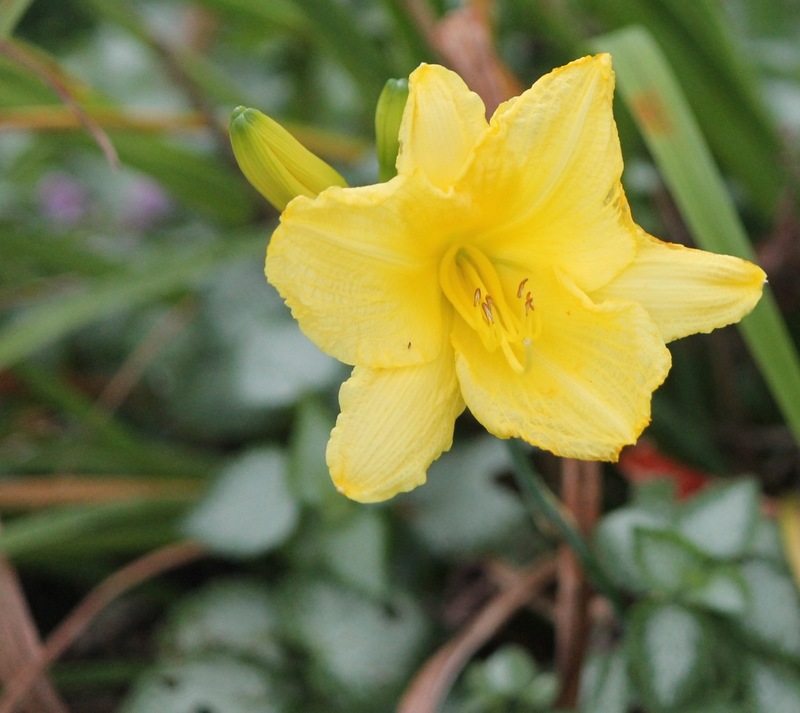 Daylily Hermerocallis 'Happy Returns' is a rebloomer having its last fling. 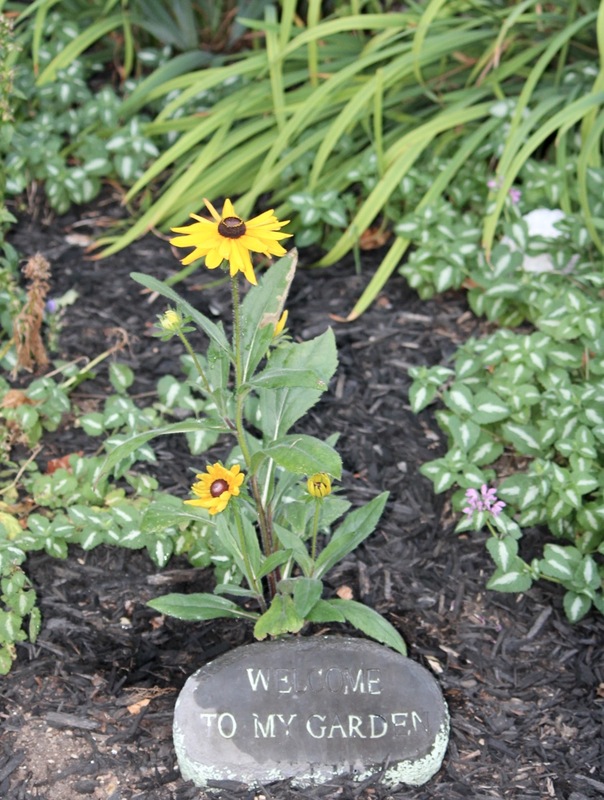 The brown-eyed Susan, given to me by a visitor this summer, has five or six flower heads already. I hope this short-lived perennial stays a while in my garden. I am linking with Carol at May Dreams Gardens for everyone's favorite meme 'Garden Bloggers' Bloom Day.' I'm going over there now to see what is blooming in gardens around the world. Won't you join me? 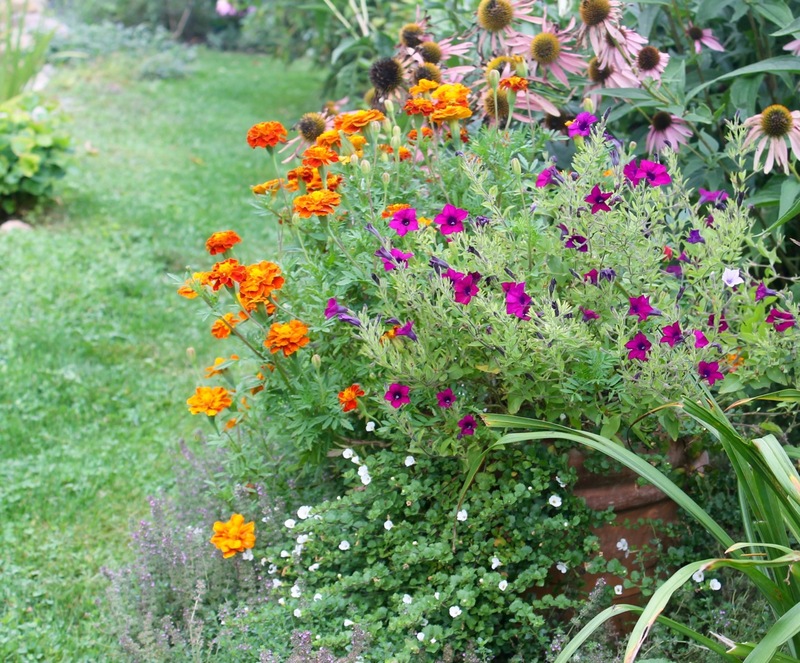 I moved a clay pot with Petunia (ex small-flowered magenta,) marigold Tagetes sp. and bacopa 'Snowstorm giant snowflake' into the main cottage garden border. 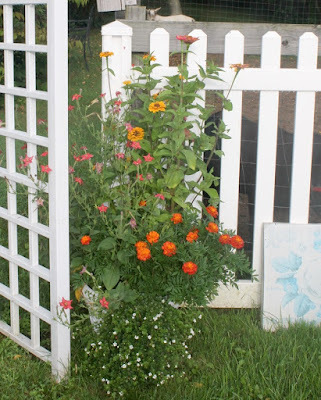 I did this to fill a gap made by plants cut back at the end of season and to provide color other than the boring pinks that remained. In spite of the extreme heat and humidity, there is a feel of fall in the air accentuated by the falling, yellowing leaves of the walnut trees and the orange and yellow colors of some of my container blooms. Every year I vow to reduce the number of containers I maintain, but they are an essential element of cottage garden design. 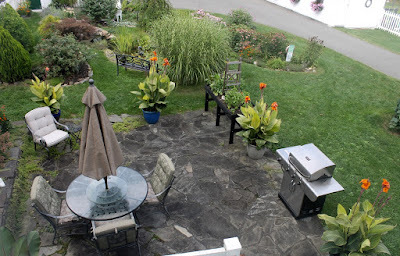 This year I have upward of three dozen: window boxes, patio pots, containers of mixed annuals, hanging baskets, and potted shade plants in the stone garden. They require daily watering and some deadheading, but I feel the labor is worthwhile. Let me show you some of them and see if you agree. On each side of an arbor in the cottage garden are twin tubs planted with Zinnia elegans 'Cut and come again,' Petunia excerta, marigolds Tagetes sp. and more bacopa. I started all (except the bacopa) from seeds indoors early in the year. I am particularly pleased that the petunias seen here and in the container at the top of this posting thrived, as it was quite difficult working with their minute seeds. I received both types of petunia seeds from Nan Ondra. 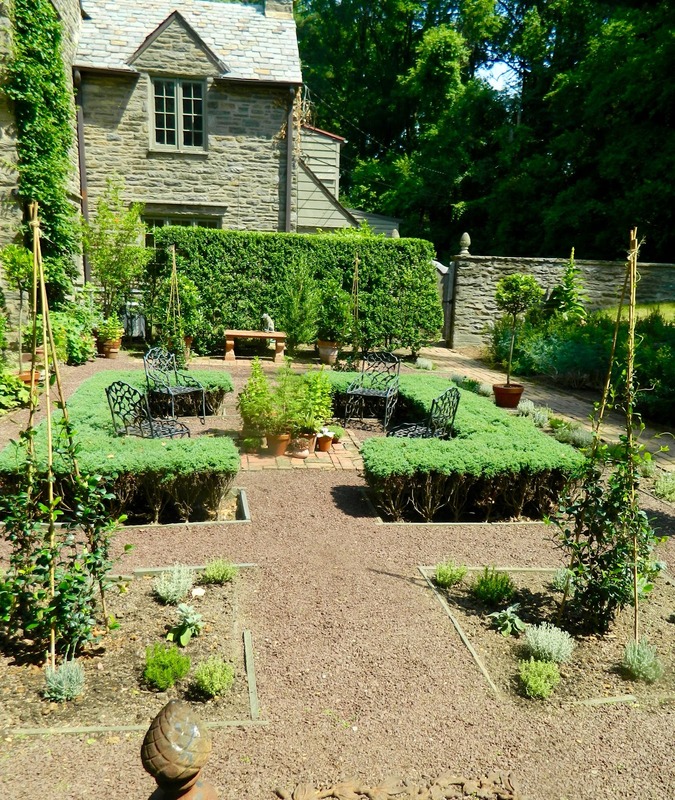 This spring, I moved the big planters that I originally bought for the bottom of the kitchen garden onto the patio. I had a desire to use large plantings to give a sense of enclosure and privacy to this area. 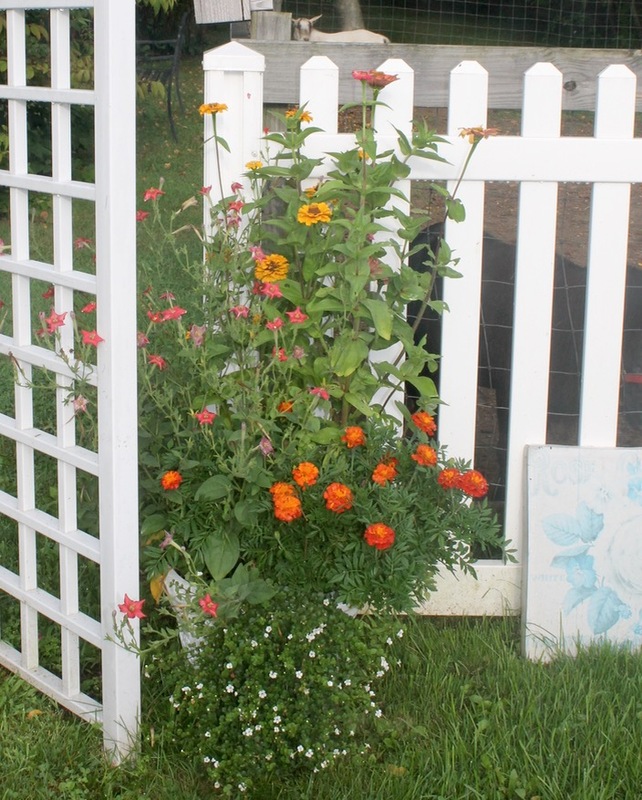 I also wanted plants to balance the tall trug containing my herb garden located on the patio. 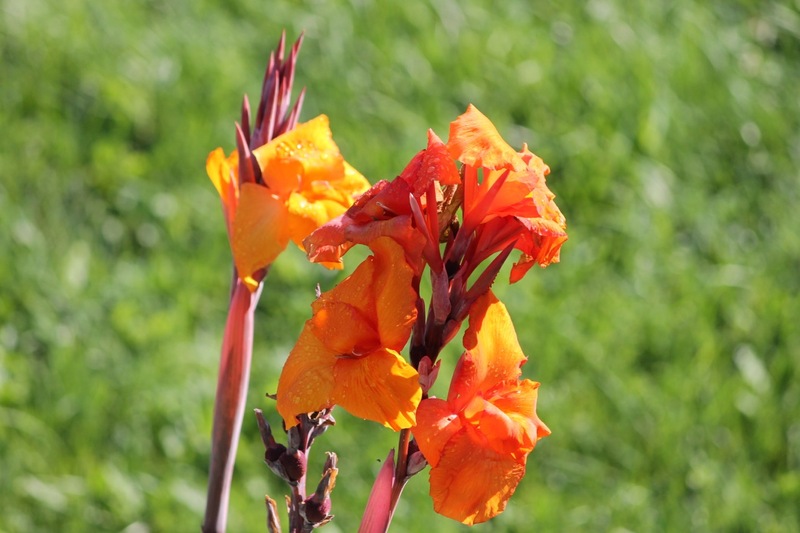 My dear friend Katharine suggested canna lilies. At first I wasn't sure, as these tropical-looking blooms do not suggest 'English cottage garden' to me. Also, I thought they may be tricky to over-winter. Putting trepidation aside, I decided to try them and purchased four from White Flower Farm. I am so glad I did as I am delighted with the stunning result. 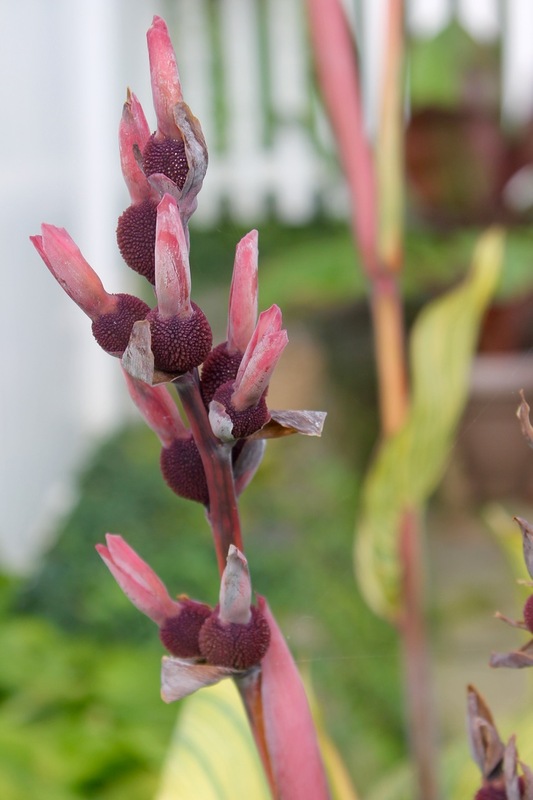 Later, when I paid a visit to White Flower Farm, I saw they had cannas in their Lloyd border designed by the head gardener at Great Dixter, providing more reassurance that they were right for my garden. Even the developing seed pods are beautiful. The patio plantings, cannas and herb garden, from the den window. 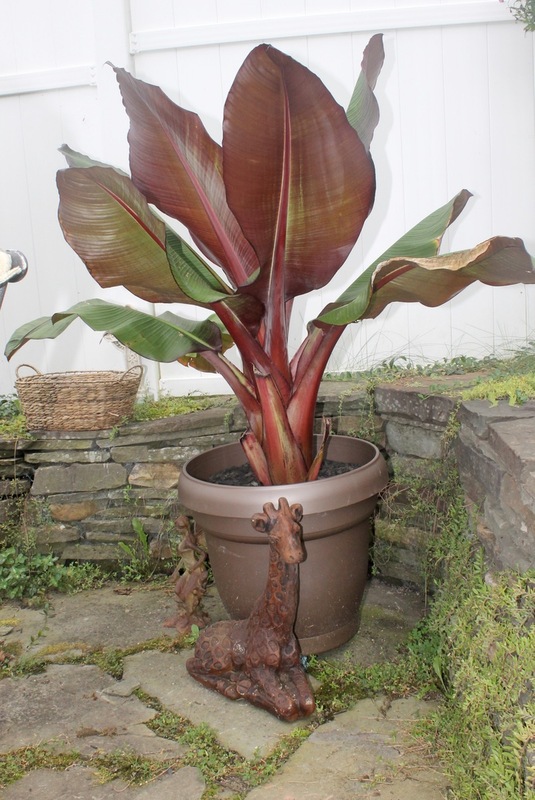 When Steve from Albanese Garden Center came to install a UV light in the pond, he gifted me the banana tree. 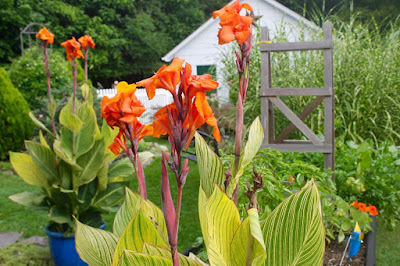 It balances nicely with the cannas although again not English cottage garden style. I thought it appropriate to place my giraffe statue near it. This sweet beauty was a present from H.H. who knows I love giraffes. The banana tree, although from East Africa, and my statue together remind me of Diana who blogs at Elephant's Eye on False Bay in South Africa. 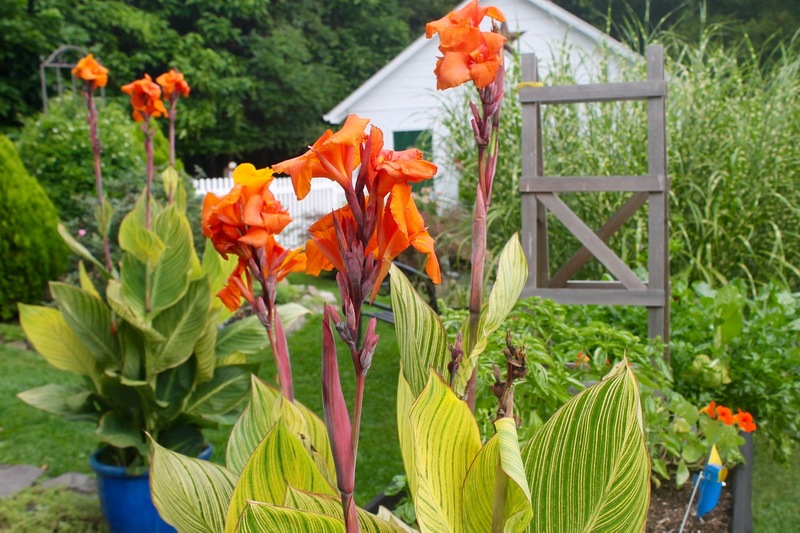 For her Dozen for Diana's meme this month I'm selecting Canna 'Striata' as my new 'must-have,' hoping I can successfully store the rhizomes over the winter and enjoy the plants for many years. 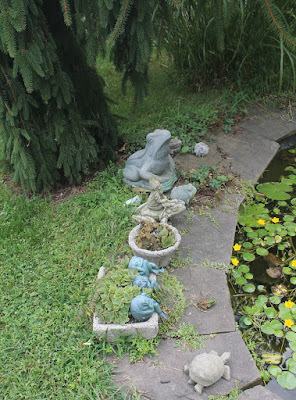 Moving from the patio to the pond, I have numerous hypertufa containers purchased or received as gifts from Point Philip Perennials. A couple I made. Most are planted with sedums. 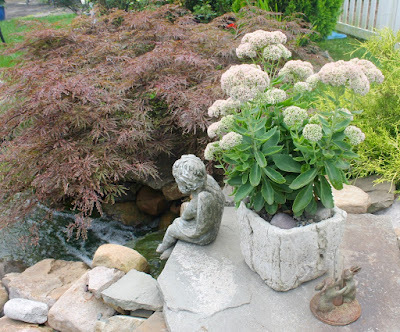 My favorite this year is Sedum 'Autumn Fire' sitting behind the angel at the top of the waterfall. 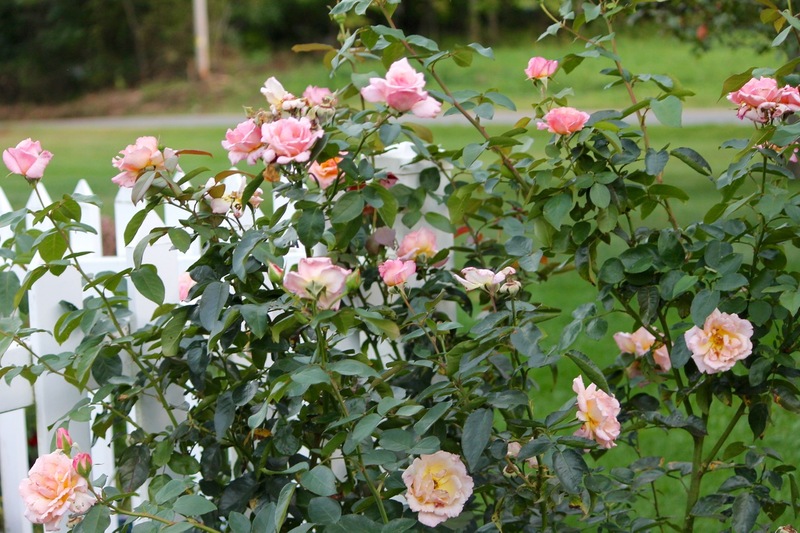 The blooms are gradually changing color from rosy pink to salmon bronze to a dark coppery red. 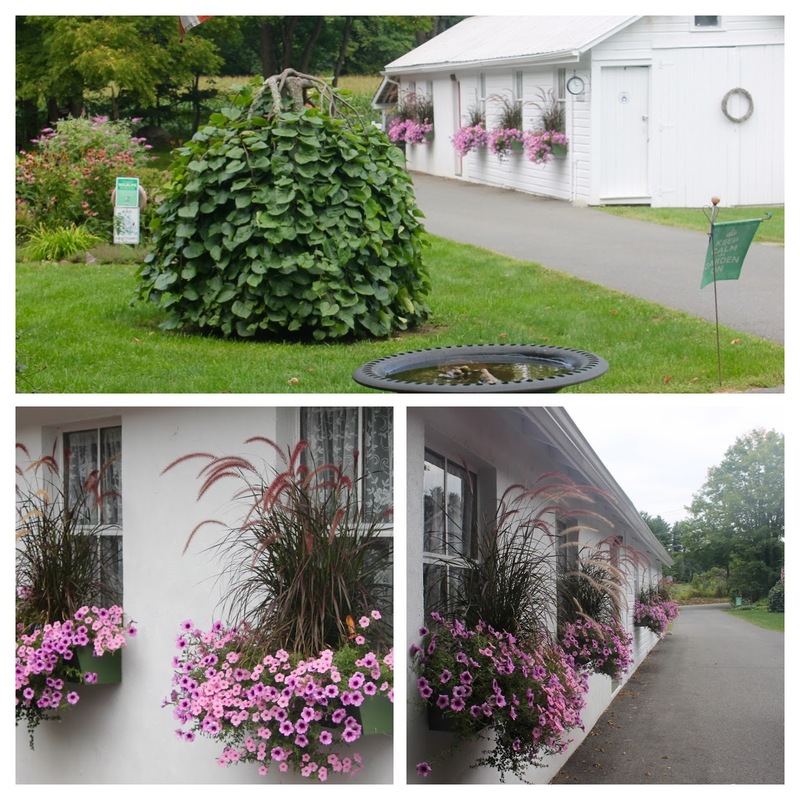 When you look across the cottage garden to the tractor shed, you will see the five window boxes filled with petunias. Again this year, I placed purple fountain grass Pennisetum setaceum in the center of each box. 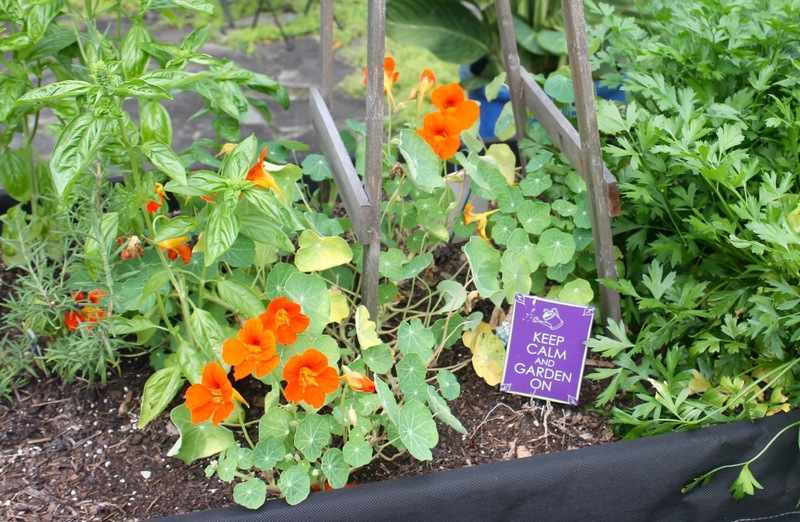 I used two different petunias: Supertunia 'Bordeaux' and Supertunia 'Sedonna.' There's also some bacopa in the center but the petunias crowded it out -- I wont use it next year. I use perennials, annuals and houseplants in my stone garden containers. The crunchy lava stone underfoot gives the area its name. 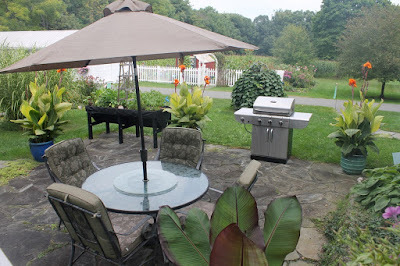 Part of the stone garden is a utility area: I place some pots to distract from the generator, air conditioner unit and water-hose link. My favorite container is filled with shade plants I rescued from the shade garden after the silver maple was felled. Japanese painted fern, ostrich fern, heuchera and lamium. 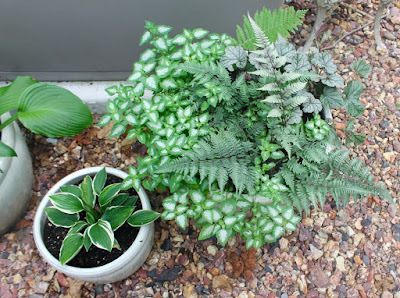 Hosta in smaller pot. 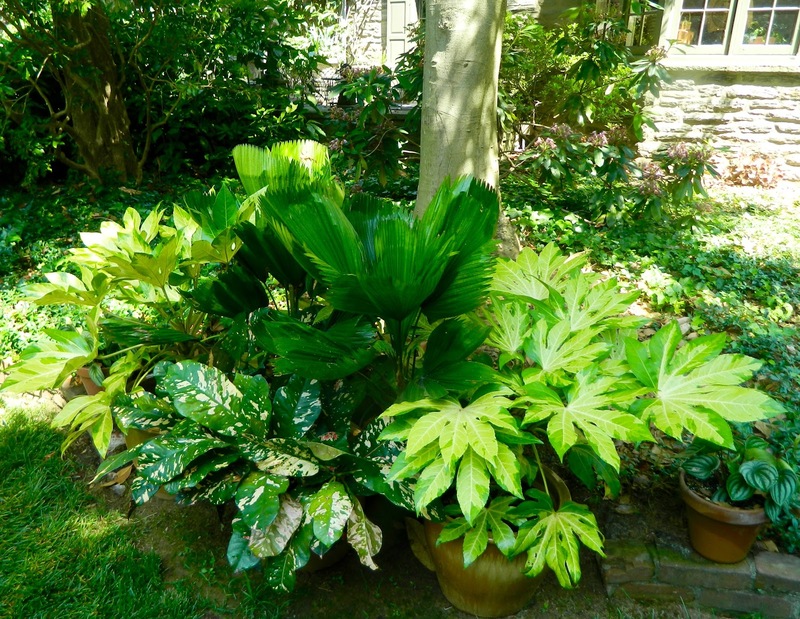 My houseplants, including begonias and Dracaena Lemon Lime plant, take a summer vacation outside. Begonia sp. in front of mirror. 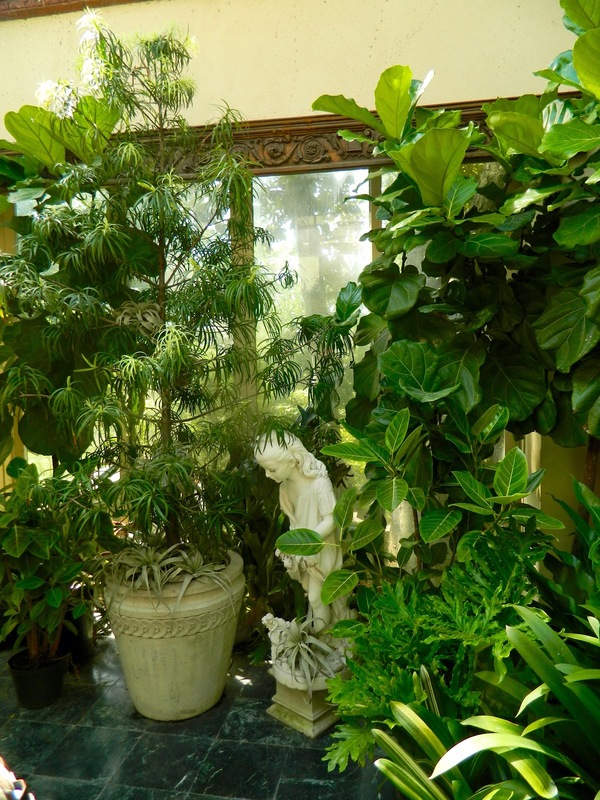 Dracaena Lemon Lime plant bottom right. 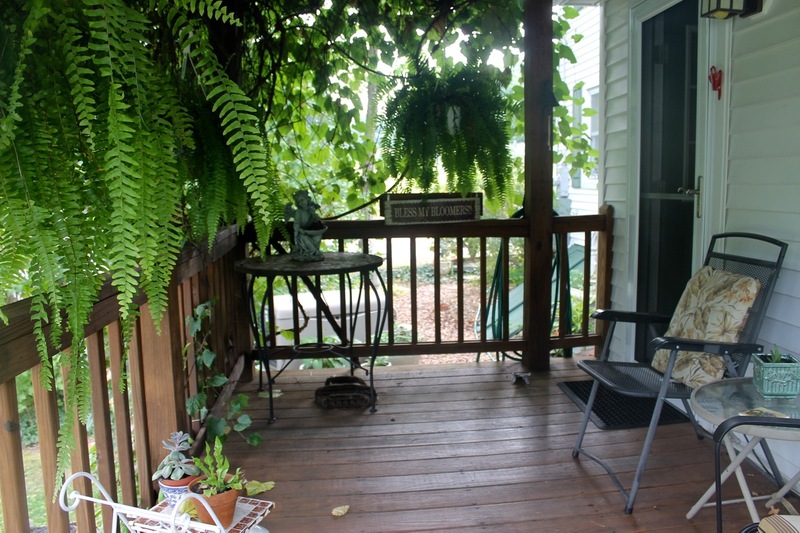 I've learned over the years that fuschia thrives in the shady conditions of the back porch and Boston ferns love the shade of the grape-covered pergola on the deck. Two fuschia of unknown species. 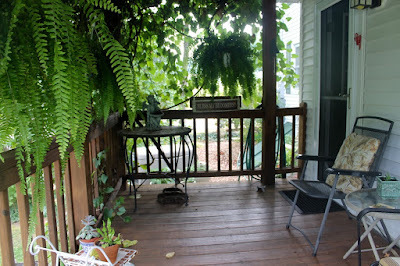 Boston ferns flourish on the deck. These are just a few of my 2016 containers. Most are 'tried and true' with the introduction of those new tropicals to provide contrast and interest. 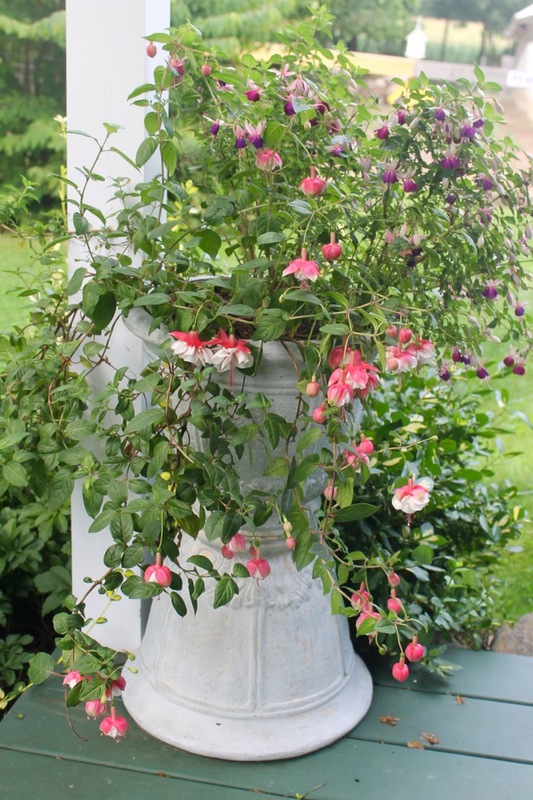 I believe planters are a wonderful addition to the cottage garden or any garden. What do you think? 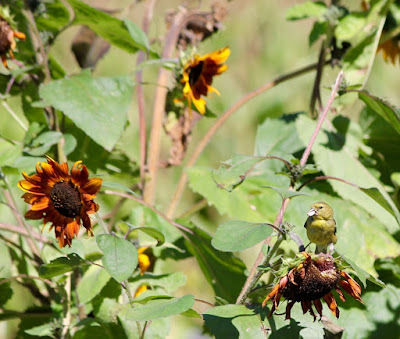 Enjoy the change in seasons! As this long, hot summer winds down, I look back on a fantastic season that included an abundance of gardening, sharing my garden, giving information about gardening in speaking engagements and newspaper articles, and visiting exquisite gardens like those at Meadowbrook Farm in Jenkintown, Pennsylvania. 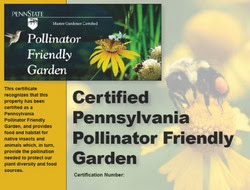 I spent time there following the Pennsylvania Master Gardeners' Conference at the end of June. 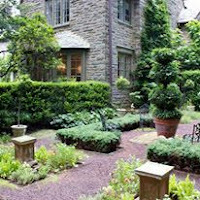 This former estate of renowned plant enthusiast J. Liddon Pennock, Jr. is now a nonprofit affiliate of the Pennsylvania Horticultural Society. 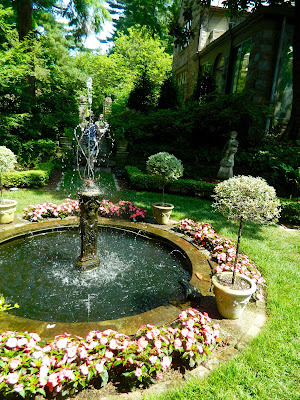 We were fortunate to tour house, gardens and garden center under the guidance of Meadowbrook Farm's director, Jenny Rose Carey. The previous day, the last day of the conference, Jenny Rose gave a wonderful talk about shade gardening. I was drawn to her immediately, not only because of her knowledge and enthusiasm, but also because like me she is an English ex-pat. 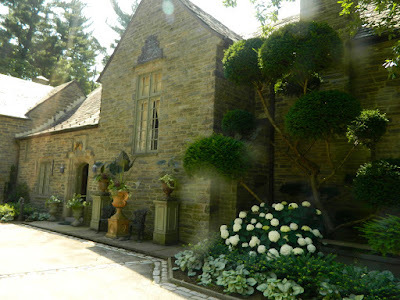 First on the tour, Jenny Rose showed us around the ground floor of the house. 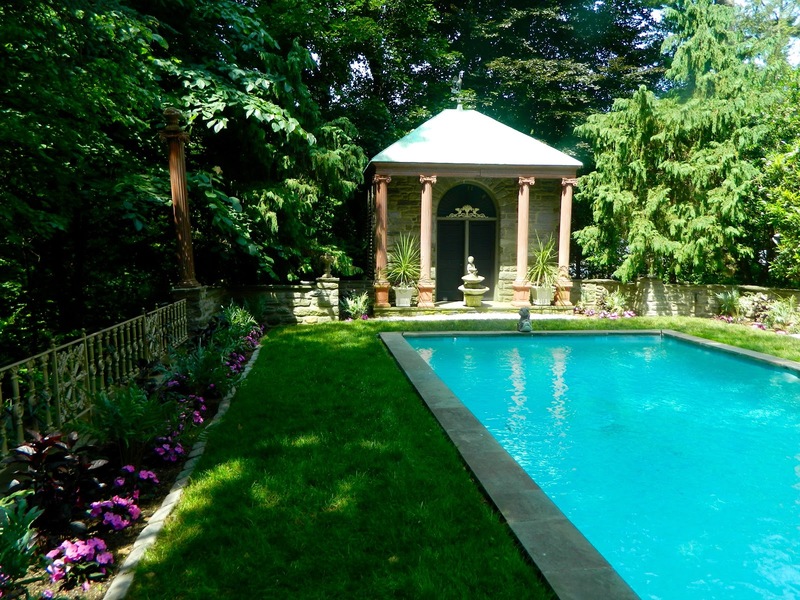 Designed by architect Robert McGoodwin in the English Cotswold style, the house was given to Pennock and his wife, Alice, as a wedding gift by Alice's parents. The rooms are somewhat quirky in their decoration exemplifying Pennock's eccentric personality. 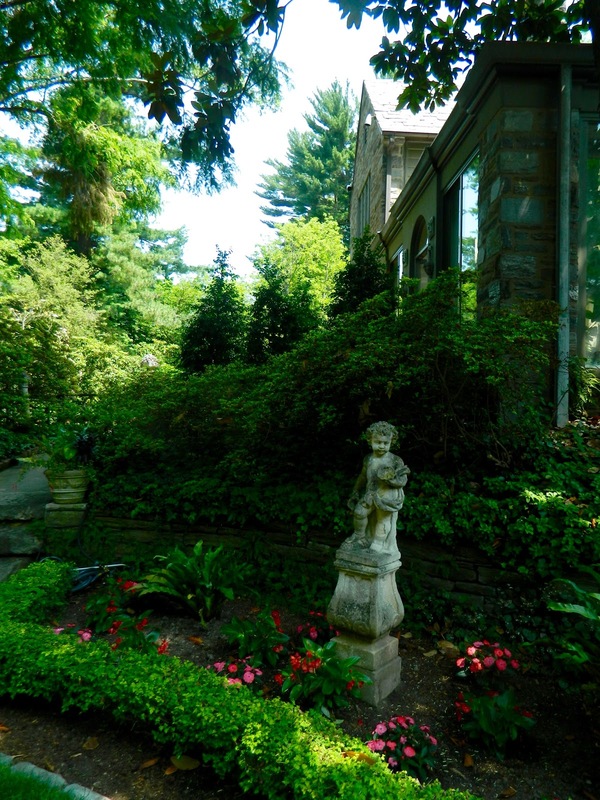 Rich details are abundant inside and outside the house. 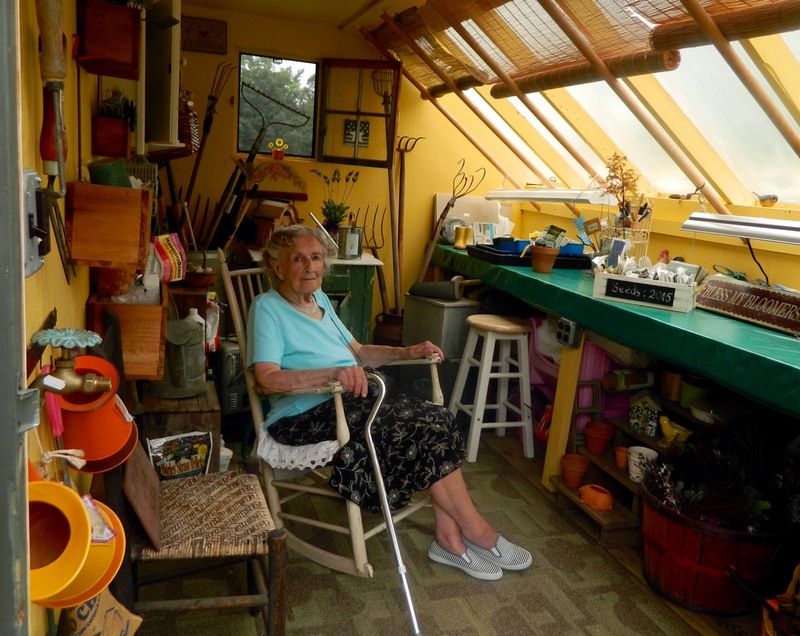 There were impressive houseplants and flower arrangements throughout. The rooms open onto garden rooms -- outdoor living spaces. 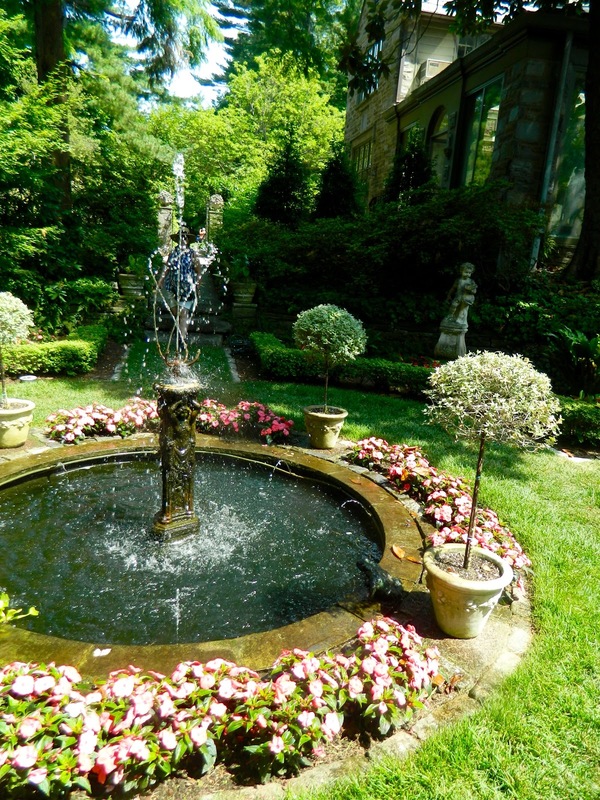 There are 15 small gardens in all. I didn't have a favorite, loving the formal statuary and the sense of enclosure created by walls, wrought iron fences and boxwood hedges in each area. 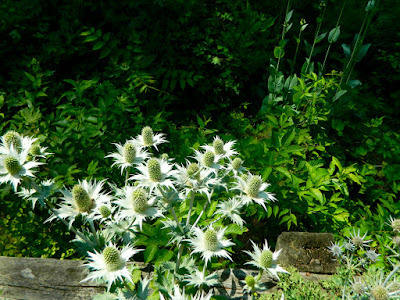 I saw Sea Holly Eryngium in several places I visited this summer -- need to get some. 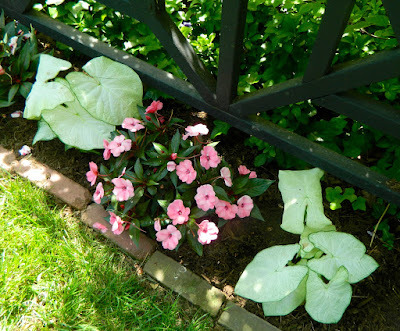 Love the use of caladium in the borders. Varied textures and shades of green make a great display and hide flaws. 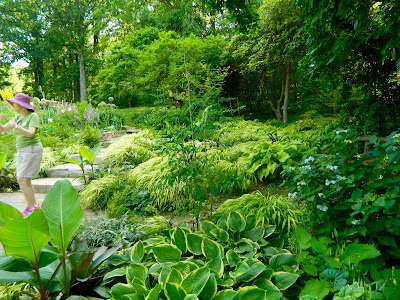 Jenny Rose led the group into the shade garden which I found particularly stunning. 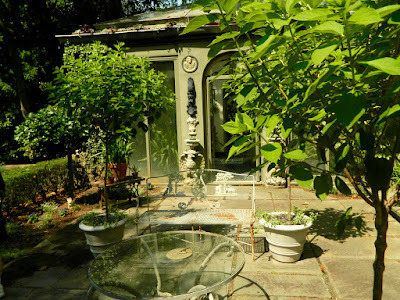 Jenny's forthcoming book, to be published by Timber Press, is about shade gardening. Can't wait to read it. Jenny Rose tells us about the shade garden plantings. 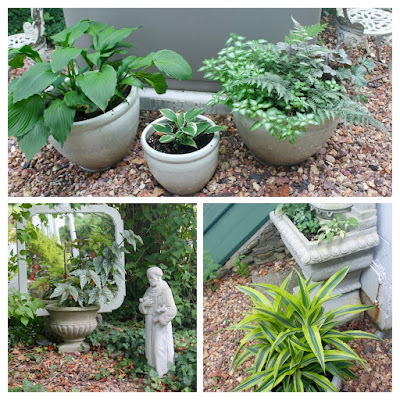 I decided to add some to my shade garden because I love the cascading foliage. I had several spaces caused when the shade garden became a part-shade garden with the removal of the silver maple. I planted the grasses in groups of three. 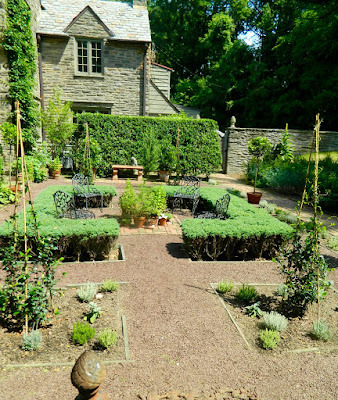 My decimated 'shade' garden -- looking a little fuller with new plantings. 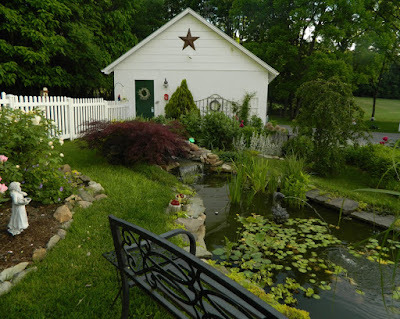 After touring the house and gardens it was time to explore the fabulous garden center. There were unusual plants, flowering baskets, trees and shrubs. Of course I was like a kid in a candy shop. This was my friend's purchase -- she beat me to it. 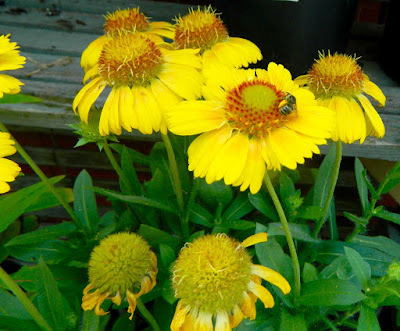 I think it's Echinacia paradoxa. 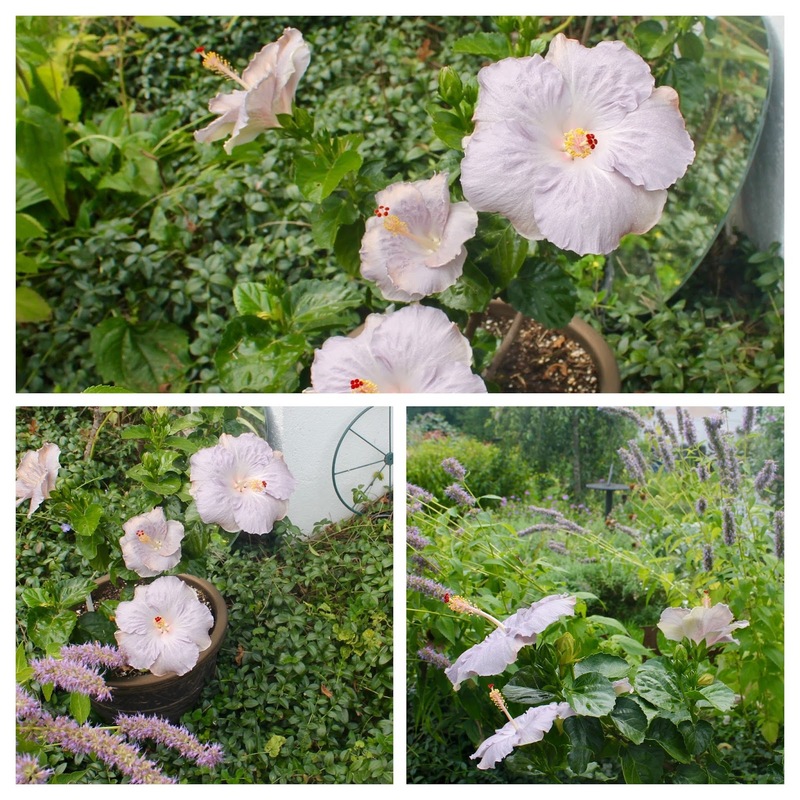 I settled for an unusual double hollyhock that I felt would enhance my English cottage garden. I purchased a cute stone turtle for H.H. He placed it by the pond. 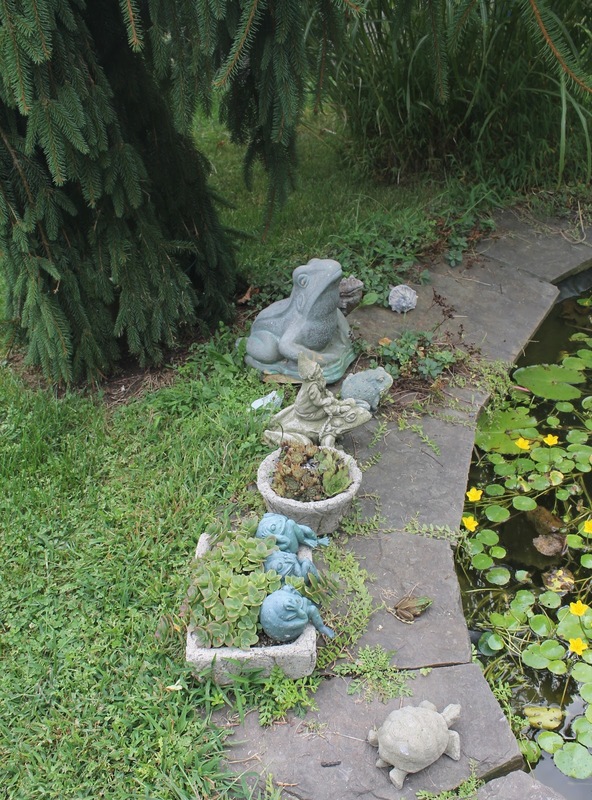 Stone turtle and frogs plus a real frog -- can you see it? 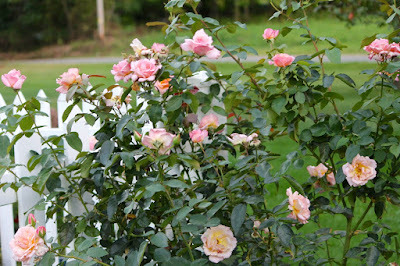 Four weeks later I was delighted to welcome Jenny Rose to my garden. 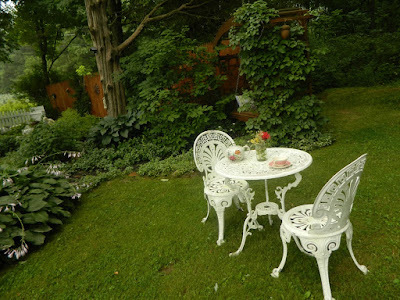 She came for tea, of course, so I served cucumber sandwiches, scones and raspberry trifle on the patio. 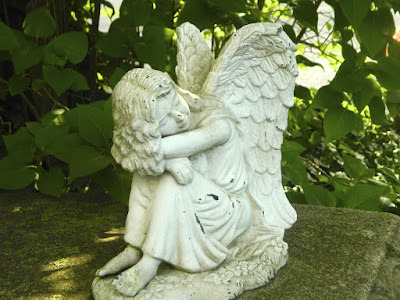 I enjoyed her visit so very much. 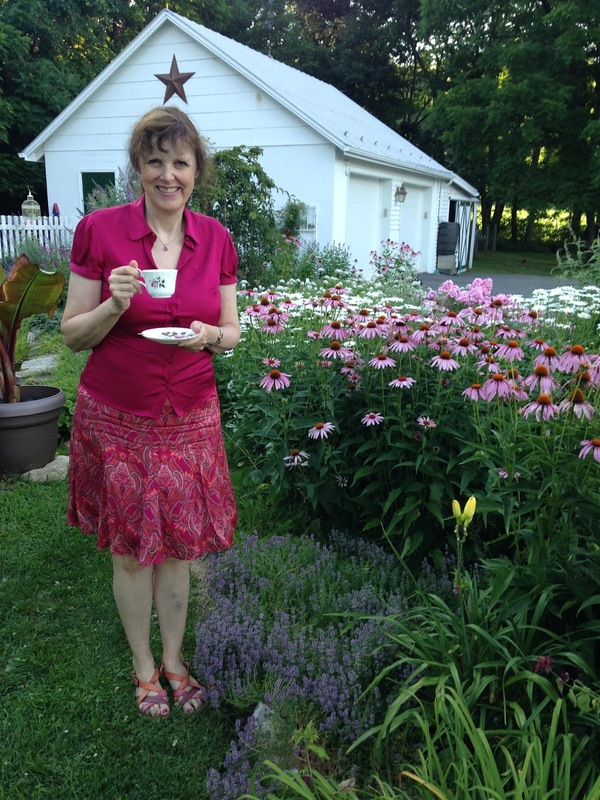 I learned a lot from this very knowledgeable lady about plants in my garden, garden design and about writing a book. My thanks to Jenny Rose for motivating me to use my DSL camera, so that I am no longer afraid of it, and to buckle down and WRITE. Thanks also for the beautiful hibiscus that is giving me endless pleasure with its prolific, pale lavender-colored blooms. 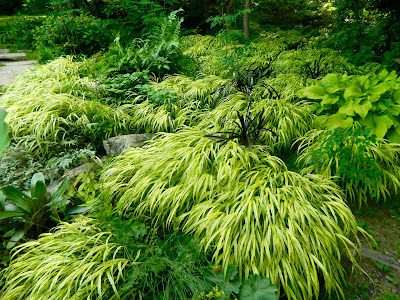 This is one of Meadowbrook Farm's most unusual and extremely beautiful plants. I am thrilled with it. This was a great summer for me, dear fellow gardeners and bloggers. What about yours? 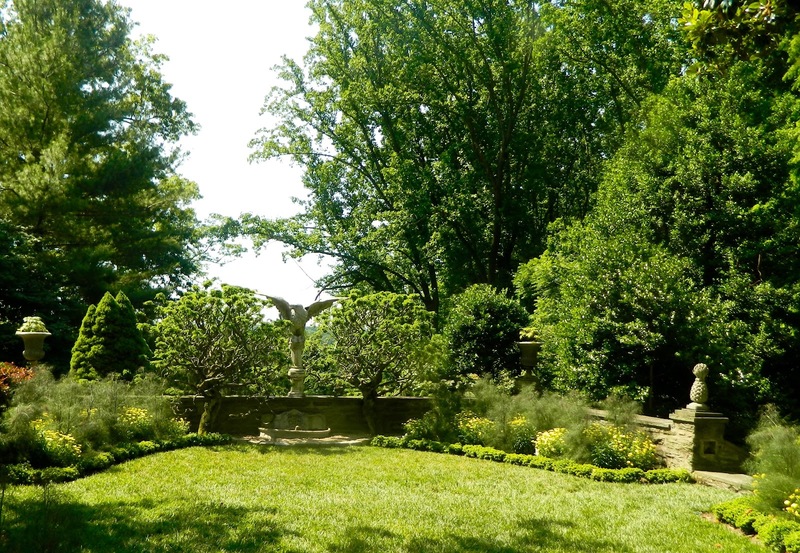 Did you visit any private or public gardens? 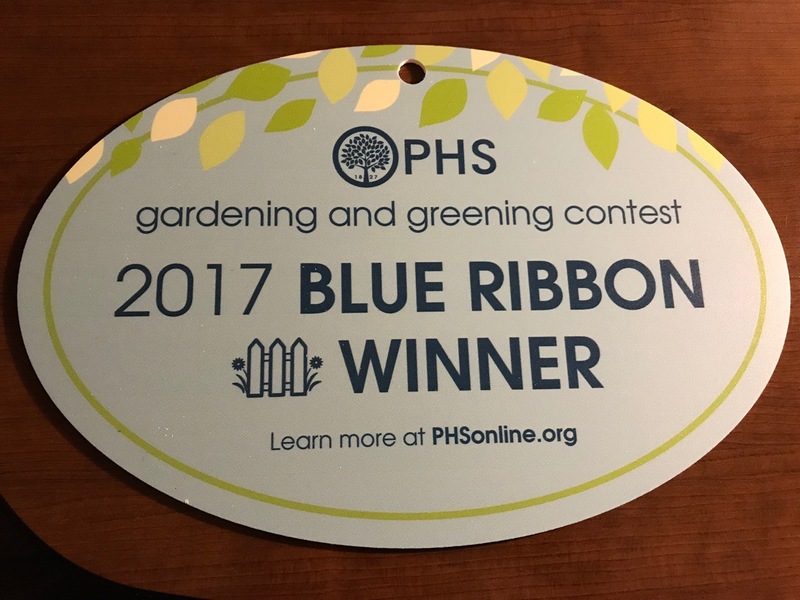 Enjoy the rest of the summer if you are in the Northern Hemisphere and have a wonderful new gardening season if you live in hotter climes.